The given paper presents the state of the art in the FPGA-based logic emulation. The analysis of the existing emulation solutions is performed according to the following classification: (1) large emulation systems (Quickturn , Ikos , MentorGraphics ); (2) semi-custom rapid prototyping boards (Aptix , Simutech ); (3) custom prototyping solutions (Transmogrifier2 , Weaver , Replica , FPGA vendors demonstration and prototyping boards , , microprocessor-based boards, etc.). Each system is exposed in terms of its capacity, architecture, used FPGAs and performance. Design & Reuse Design Platform Catalog, http://www.design-reuse.com/PROTO_PLATFORM/proto_platform_l.html. Europe Technologies EVM 40400 Application Notes, http://www.europe-technologies.com/evm40400_appnotes.htm. 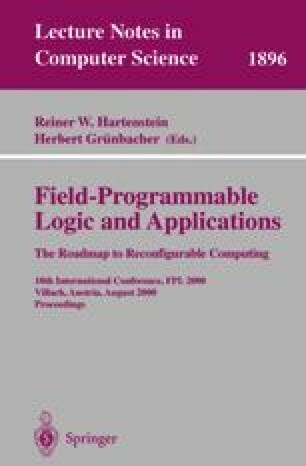 S. Guccione, ”List of FPGA-based Computing Machines”, http://www.io.com//guccione/HW_list.html (1983). Velocity: Rapid Silicon Prototyping System, http://www-us.semiconductors.philips.com/technology/velocity. SIDSA ARM Emulation Boards, http://www.sidsa.com/ARM.htm.